Benedict Cumberbatch's "Star Trek Into Darkness" character has remained a mystery to fans, but a new official still from the J.J. Abrams film has finally revealed his name. Or, perhaps, "name." 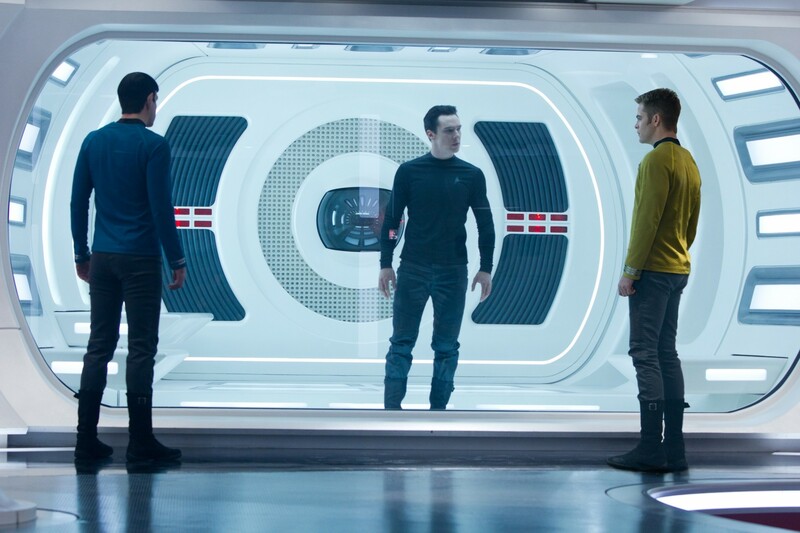 (Left to right) Zachary Quinto is Spock, Benedict Cumberbatch is John Harrison and Chris Pine is Kirk in STAR TREK INTO DARKNESS from Paramount Pictures and Skydance Productions. Which raises the question: Who is John Harrison? Cumberbatch plays the villain in "Star Trek Into Darkness," but fans have debated about just which villain. Speculation has run rampant that Cumberbatch is playing iconic "Star Trek" villain Khan, an idea that was furthered by a brief shot in the Japanese teaser trailer for the film. Of course, Cumberbatch could also star as Gary Mitchell, a famed "Star Trek" villain from the television series. So! "John Harrison" could be a red herring. Or it could be the actual name of Cumberbatch's bad guy. Or maybe Cumberbatch is playing twins? Or triplets? The possibilities are endless! Find out just who he's playing when "Star Trek Into Darkness" arrives in theaters on May 17, 2013.